Tie in 4-6 fibres of GP tippet. Tie in both tinsels. Carry thread forward to 1/6 from eye. Wind flat tinsel forward in even overlapping turns to make body. Tie off. Wind oval silver tinsel forward to rib body in equal turns. Tie off. 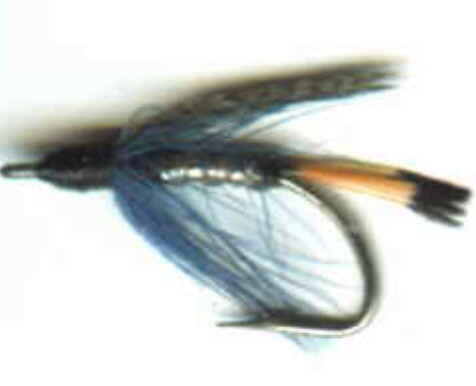 Tie in blue hackle in front of body. Make 2 turns only. Make head, tie off with whip finish behind eye. Clear or black varnish.